ANOKA, Minnesota – Federal Premium Ammunition is pleased to announce it is now the official shotshell ammunition sponsor and supplier of USA Shooting. The sponsorship strengthens the non-profit organization’s efforts to promote the shooting sports and prepare American athletes to bring home gold from Tokyo in summer of 2020. USA Shooting was chartered by the United States Olympic Committee as the National Governing Body for the sport of shooting in April 1995. The group's mission is to prepare American athletes to win Olympic medals, promote shooting sports activities throughout the U.S., govern the conduct of international shooting in the country, and aid in developing the next generation of responsible gun owners and sports participants. For details, visit: usashooting.org. Federal Premium is set to join forces with the world’s top shotgun program as America’s shotgun athletes earned 13 World Championship medals in 2017 while winning 27 Olympic medals overall. 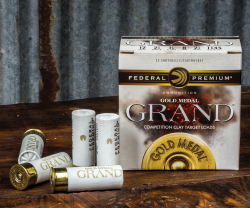 As part of the new partnership, Federal Premium will also collaborate on marketing efforts and create specially marked boxes of Gold Medal shotshell, pistol and rifle ammunition to build greater awareness of USA Shooting.